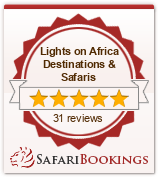 LIGHTS ON AFRICA DESTINATIONS & SAFARIS is committed to protecting the privacy of everyone who visits our web site. We do not share your information or email address you provide. We use the information you provide in this form only to complete your reservation or assist you in choosing the best Safari. We do not share this information with outside parties except to the extent necessary to complete your reservation. © Lights on Africa 2018. All rights reserved.